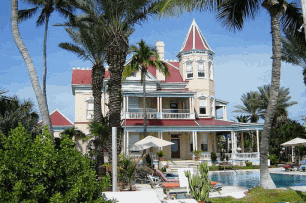 The Southernmost Hotel, is a 3 star hotel right at the southernmost tip of Key West, and is quite famous. 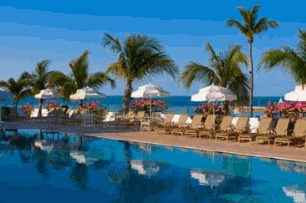 As you look for hotels in Key West Florida you may well have seen its image whenever you type in the word Key West. Found at 1319 Duval Street, the hotel was built in the 1920’s of Gingerbread architecture, the kind of house that looks like it has been made of candy. It is a mixture of traditional Key West and native flora, perfect for where it is situated in the Old Historic Town District of Key West. As you walk into the lobby you will know without a doubt that you are in the Southernmost Hotel in Key West Florida Keys! If you are looking for things to see and do, just a couple of minutes stroll from the Southernmost Hotel is the popular Southernmost Point marker, a landmark the marks for many the southernmost point of America. Well at least the mainland part, as a few people consider Hawaii to be further south, to which just a quick glance at the map will show you that they have a point. Other things that are worth taking a look, found near the hotel include the peaceful and beautifully constructed Butterfly Conservatory, the historic home and writing refuge known as the Ernest Hemingway Home and Museum and last but not least Fort Zachary Taylor Historic State Park. It really is a boom area of Key West with most large retail franchises in attendance around the Southernmost Hotel as well. But you may not want to slog around the streets all the time. So what can you do to relax with the confines of you chosen hotel? Well, it boasts all the services and facilities that you would want to make your visit to Key West as enjoyable as it should be. The hotel has two swimming pools, with one of them sitting unusually right in the middle of the parking lot. But don’t worry about dodging parking cars, and you do a few lengths, as it is well hidden by lush greenery and a wall. The courtyard features the main pool surrounded by decking, and a hot tub too. And in typical Key West fashion the word “Tiki” is not far away, as each of the pool has its own Tiki bar by the side. So you can jump straight out of the water and dive into one of Key West famous cocktails such as the Rum Runner. The 127 guest rooms found in this iconic Key West hotel have either two double beds, or a king sized or queen sized bed. Whilst some rooms include sleeper sofas. So if you fancy a bed to yourself (or just sleeping as far away from your partner as you can) then make sure you request the bed size when booking your stay. One of the problems about visiting Key West is parking. It is very congested at the best of times, but don’t worry, as situated just across the road from the Southernmost on the Beach, the six buildings that make up the hotel are all surrounded by ample parking. So this shouldn’t be an issue. If you do want to take your car with you then make sure that you check out our guide on beating Key West Parking problems, however at only 2 miles wide and 4 miles long, most people let their feet take the strain. Although we have been talking about relaxing and basically being on vacation, this hotel is not just for vacations, as it can also can cater for business requirements. All in all if you take in the history, the location and the comfort of this hotel you couldn't chose better for your trip to Key West. What Do You Get At The Southernmost Hotel, Key West? Complimentary Coffee from 6-9 a.m.
Click On The Voucher Image And Save !!! If you fancy staying at the Southernmost Hotel then let us make your stay a little cheaper. By staying Sunday though to Thursday we can offer a certificate worth $20.00 towards a great breakfast, down at the lovely Southernmost Beach Cafe. To gain this certificate make sure that you redeem the voucher at check-in as it wont be valid if presented during stay. But note that this doesn't apply to holidays and busy periods normally around special annual events that occur in the Florida Keys.